Since 1978, Ben and Jerry’s, have been delivering “Vermont’s Finest” ice cream like no other. My personal favorite is Phish Food, and I celebrate my birthdays with a delicious Ben and Jerry’s ice cream cake. In Bloomberg Businessweek, “Why Ben & Jerry’s Launches New Ice Cream Flavors in the Winter” on January 13, 2015, we learn that Ben & Jerry’s actually brings new products to market in the middle of winter. “They’re called Boom Chocolatta! Cookie Core, Peanut Buttah Cookie Core, and Spectacular Speculoos Cookie Core. 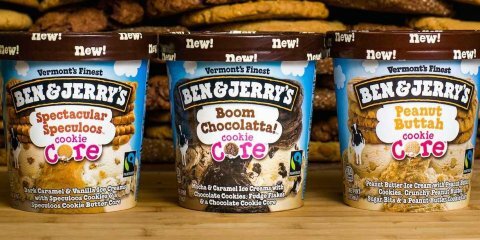 The center has a texture that’s kind of like cookie dough, but crunchier, says John Henry Siedlecki, senior brand manager at Ben & Jerry’s.” The flavors sound fantastic, yet the timing seems unusual. The article mentions that peak ice cream sales take place from Memorial Day to Labor Day. As I write this post, Washington, DC is expecting more snow this week! Interesting enough, this winter launch approach drives ice cream sales when consumers would be considering other types of dessert. Additionally, it gets consumers comfortable with the new product in time for peak ice cream buying months. In 2015, Ben and Jerry’s actually launched their ice cream a month early to get ahead of the competition! Allocate time to your priorities – Blocking time in your calendar on a weekly basis will help nourish your projects. It is amazing what you can accomplish within 25 minutes. If it is on the calendar, it is more likely to get done. Shut off your email and phone – Try using the Pomodoro Technique, which advocates for shutting off all communication so you can focus on the task at hand. Follow-up with yourself – Calendar a time once a month to evaluate your progress and make any necessary adjustments to your goals. Here’s to getting to market early in 2015!